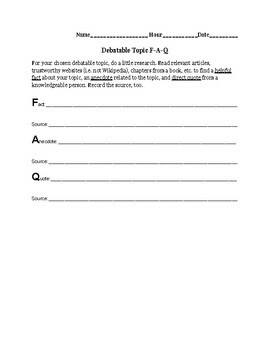 With this prewriting tool, students research a debatable (or even expository) topic to find F-A-Q: a helpful fact, an anecdote related to the topic, and direct quote from a knowledgeable person. They will record the source, too, by just title or web address (MLA citation could be added later). 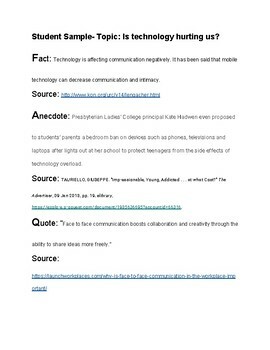 I used this tool as a Google Doc on Classroom for students to have their own copy to edit, and it worked quite well to have them complete some initial research that covered several methods (fact, anecdote, quote). 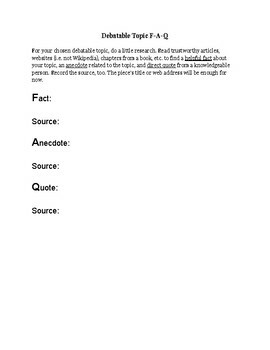 Another provided version of the document could be printed for students to write in their results. A student example is also included.